These were a mistake. A wonderful mistake. I was hoping to make these Chocolate Revel Bars, which are amazing and one of my favorite bar cookies. I mixed the oatmeal cookie bar portion, then realized that I didn't have sweetened condensed milk for the chocolate filling. I thought I could make my own, but it turns out that is a 2 hour process of reducing milk and sugar. No thank you. So, I made a cream cheese filling to replace the chocolate filling, and added lots o' chocolate chips. So good. Preheat the oven to 350, and grease a baking pan. 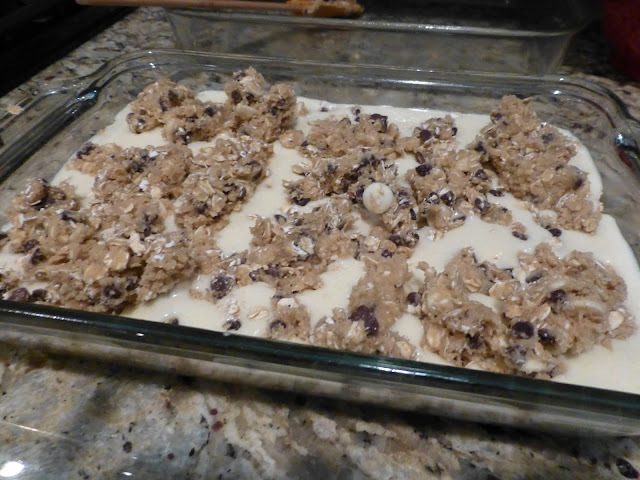 Spread 2/3 of the oatmeal bar mixture into the pan. In a bowl, beat the cream cheese and butter together. Add in the egg, then stir in the flour to combine. 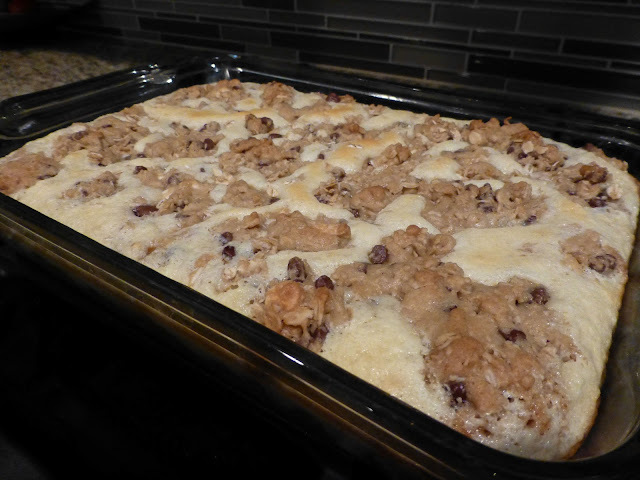 Pour the cream cheese mixture over the cookie dough. Drop the remaining dough over the cream cheese in small pieces. Bake for about 25 minutes, or until top is lightly browned.